Chiang Mai on Tuesday morning had the world's worst air quality. The northern tourist city, Thailand's second city, was ranked the number 1 air-polluted city with a 209 air quality index score on airvisual.com, before the air then worsened to an AQI of 234 around noon. Meanwhile the Pollution Control Department (PCD) reported the average 24-hour level of PM2.5 dust particulates had reached dangerous heights in all nine northern provinces of the Kingdom. The Thai safety limit for PM2.5 is 50 micrograms per cubic metre of air, while the safety limit for AQI is 100. According to the PCD report, the 24-hour average level PM2.5 at 9am ranged from 58mcg to 146mcg in the nine northern provinces. 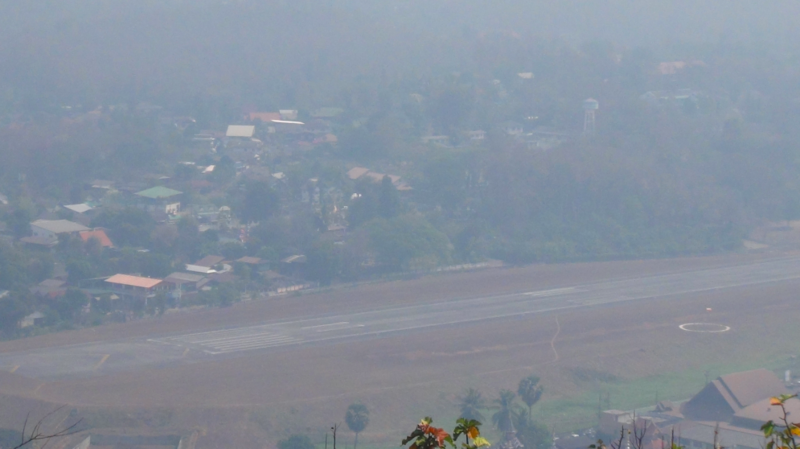 The areas with beyond-safe PM2.5 levels included the tambons of Mae Pa (79mcg, with a 172 AQI) in Tak's Mae Sot district; Nai Wiang (103mcg, with a 213 AQI) in Nan's Muang district, and Huai Kon (91mcg, with a 201 AQI) in Chalerm Phra Kiat district; Ban Klang (114mcg, with a 224 AQI) in Lamphun's Muang district; Wiang (71mcg, with a 152 AQI) in Chiang Rai's Muang district and Wiang Phang Kham (146mcg, with a 256 AQI) in Mae Sai district; Na Chak (121mcg, with a 231 AQI) in Phrae's Muang district; Jong Kham (87mcg, with a 192 AQI) in Mae Hong Son's Muang district; and Ban Tom (70mcg, with a 149) in Phayao's Muang district. Safe levels were also exceeded in tambons Phra Baht (105mcg, with a 205 AQI) in Muang district and Ban Dong (124mcg, with a 234 AQI); Sop Pad (82mcg, with a 180 AQI) and Mae Mo (121mcg, with a 231) in Mae Mo district of Lampang; and Chang Pheuk (105mcg, with a 215 AQI), Suthep (73mcg, with a 158 AQI) and Sri Phum (98mcg, with a 208 AQI) in Chiang Mai's Muang district; and Chang Kherng (58mcg, with a 120 AQI) in Chiang Mai's Mae Chaem district. Forest fires, which have erupted in many parts of the North, were largely blamed for the poor air pollution. The satellite image report on Monday showed that the nine northern provinces had a combined 929 hot spots, mostly in forestland. In Chiang Mai 121 hot spots , Nan had the highest number at 176 hot spots. The neighbouring countries of Myanmar and Laos had 4,487 hot spots and 3,440 hot spots respectively. 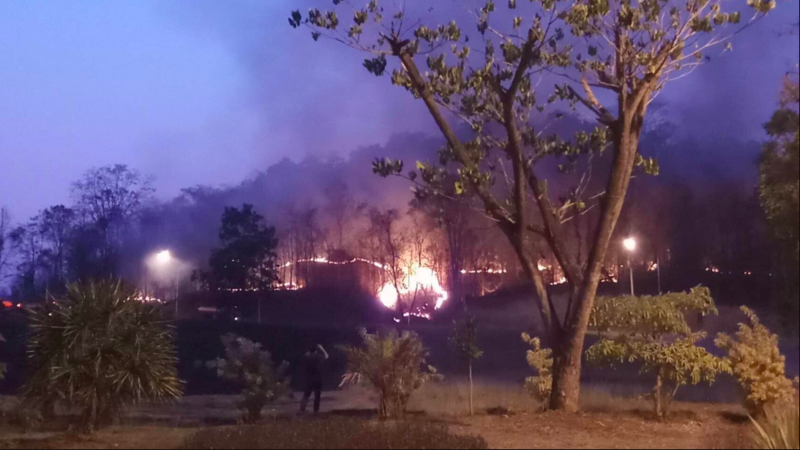 In Phayao's Muang district, nearly 100 officials were dispatched on Monday evening to fight forest fires that had erupted since 7.45pm on the mountains behind Phayao University in Tambon Mae Ka. 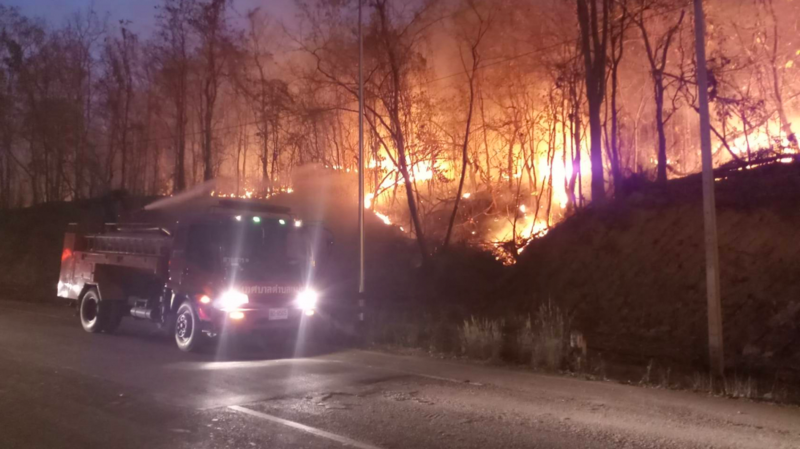 They managed to contain the fire for the most part by night's end. The officials continued to fight fires in the area on Tuesday morning and said that the blazes had damaged hundreds of rai of forestland in the area.